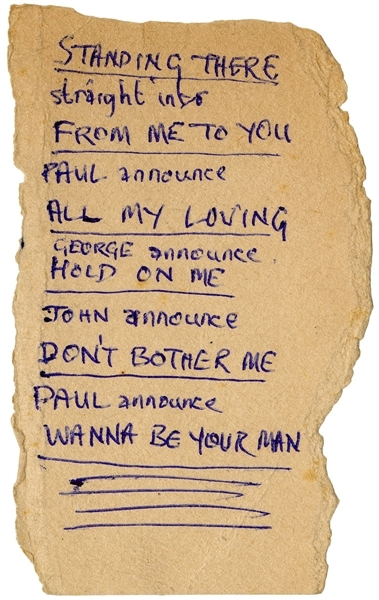 Paul McCartney hand wrote this Beatles 1963 concert set list in blue ballpoint pen and John Lennon and Ringo Starr have signed the verso in blue ballpoint pen. 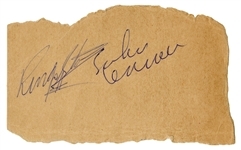 The set list has been authenticated by Beatles handwriting expert Frank Caiazzo to be in the hand of Paul McCartney, the signatures to be in the hand of John Lennon and Ringo Starr, and comes with a letter of authenticity from Frank Caiazzo (an image of the letter is shown here in the listing). The handwritten and signed song list was originally obtained by a 17 year old student student at the Savoy Hotel in Cheltenham on November 2, 1963. She had seen the Beatles the day before, November 1st, when they performed at the Cheltenham Odeon. She went to the hotel the next day on the off-chance she might see the Beatles and was richly rewarded when she was outside the hotel and saw John and Ringo run out to a black cab. She approached the cab and they wound down the window. She asked John and Ringo for their autographs, but said that she didn't have an autograph book with her. She remembered Ringo taking a long time looking in his jacket for something to write on, and then he pulled out this set list and signed it, and then gave it to John to sign. We believe this set list to be for the concert that was held on November 1, 1963 at the Cheltenham Odeon because it was still in Ringo's pocket when he gave it to the student the next day. The six songs listed are "(I Saw Her) Standing There", "From Me To You", "All My Loving", "(You Really Got A) Hold On Me", "Don't Bother Me" and "(I) Wanna Be Your Man." Paul hand wrote directions for each song, writing: "Standing There, Straight into From Me To You, Paul Announce All My Loving, George announce Hold On Me, John announce Don't Bother Me, Paul announce Wanna Be Your Man" with several lines underlining the last song. The song "Don't Bother Me" was written down but it wasn't performed at the concert, maybe because George had changed his mind about singing it as he hadn't written it that long before and it was only released on the "With the Beatles" album at the end of November. Measures approximately 2.75 x 4.5. Very good condition. 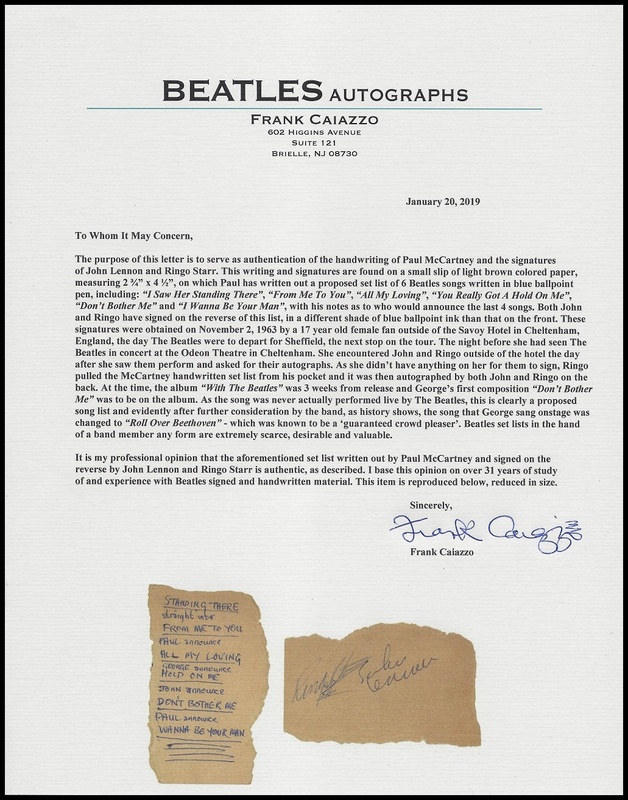 Accompanied by a letter of authenticity from Frank Caiazzo, a letter of authenticity from Tracks Ltd., and a Gotta Have Rock & Roll™ Certificate of Authenticity.